If you have a home-based business, you need a separate room or place where you can carry out all your daily tasks diligently. Although it may sound tempting, the kitchen table definitely isn’t the best place to set up due to the lack of comfort and the high number of distractions. In order to be productive at home you need a dedicated home office space and you can create one with just a table, chair, study shelves and some office supplies. But, over time, as you work in your home office, documents stack up and spread around, supplies become disorganized and software boxes and CDs, used coffee mugs, orphaned pens and bills are all left laying around – until one day something disappears or gets in your way, then you suddenly realize that getting your home office organized is long overdue. 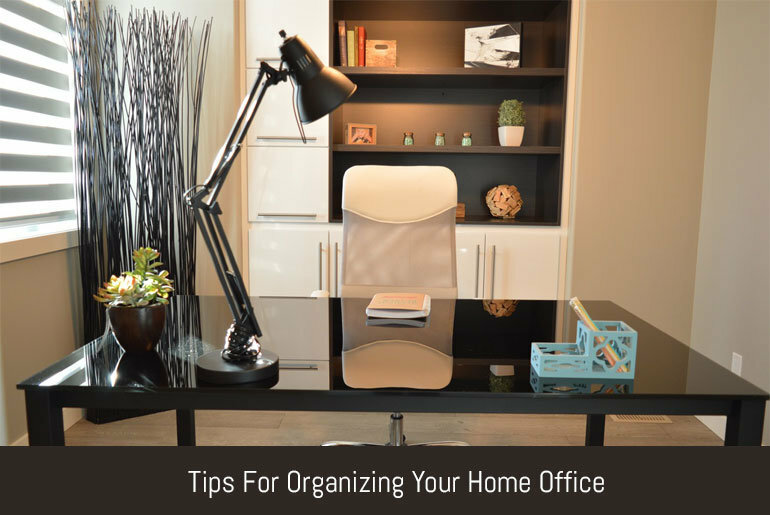 You’re probably thinking that you don’t have time to organize your home office, but if you really knew how much time that disarrangement cost you, you would reconsider the thought. It tends to be overwhelming at first glance, but the advantages when you clean the space and order everything certainly makes for enhanced productivity and less wasted time. In fact, maintaining a home office becomes more manageable if you treat it like an on-going project instead of a huge single attempt. So, if you are all set to get started, the following tips will help you turn your cluttered office into an efficient workspace. Shred, de-clutter, empty, get rid of all the “stuff” that you don’t need or use. Look around. What are the things that you haven’t used in a while? Take one area at a time. Whether it is any equipment, furniture or supplies, if you haven’t used it in months and can’t think of using it in the near future, out it goes. Don’t forget about decorations, knick-knacks or plants – if they are covered with dust and making our space look shabby, they are fair game. Gather up every item which was scattered and put it where it belongs. Decide which type of activity takes place in each area of your office. You’ll probably have a desk where a computer is kept, a cabinet area with shelves where binders and books are being stored, and a supply area which has drawers, closets. Place the appropriate supplies and equipment in the proper area. In an organized space, you definitely won’t need piles of paper, but you still have to sort out the old ones. Go through the pile once and file them appropriately or dump the ones which aren’t of any use. Put used items in the same drawer space: sticky pads with notepads, stamps with envelopes, etc. For personal items, use a separate drawer away from your main work items. Keep your archived files in inexpensive storage boxes to move them out of your current file space. You can also store catalogues, magazines and old files for even more free space. Keep these storage boxes in your attic space for a while in case need them for research or reference purposes otherwise if they’ve not been touched for ages, recycle them. Organizing your office may take a lot of time and energy, but these tips can definitely help you in enhancing your productivity and saving a lot of time.